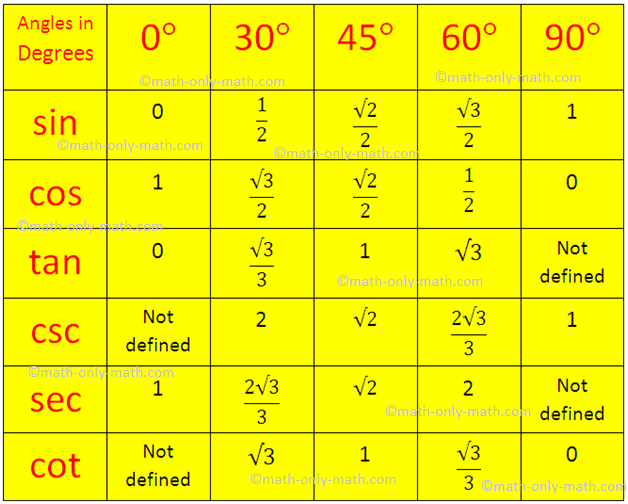 The Trigonometrical ratios table will help us to find the values of trigonometric standard angles. The standard angles of trigonometrical ratios are 0°, 30°, 45°, 60° and 90°. The values of trigonometrical ratios of standard angles are very important to solve the trigonometrical problems. Therefore, it is necessary to remember the value of the trigonometrical ratios of these standard angles. The sine, cosine and tangent of the standard angles are given below in the table. (c) these numbers given the values of sin 0°, sin 30°, sin 45°, sin 60° and sin 90° respectively. (d) write the values of sin 0°, sin 30°, sin 45°, sin 60° and sin 90° in reverse order and get the values of cos 0°, cos 30°, cos 45°, cos 60° and cos 90° respectively. If θ be an acute angle, the values of sin θ and cos θ lies between 0 and 1 (both inclusive). cos 90° = √(4/4) = 1.
cos 90° = √(0/4) = 0. 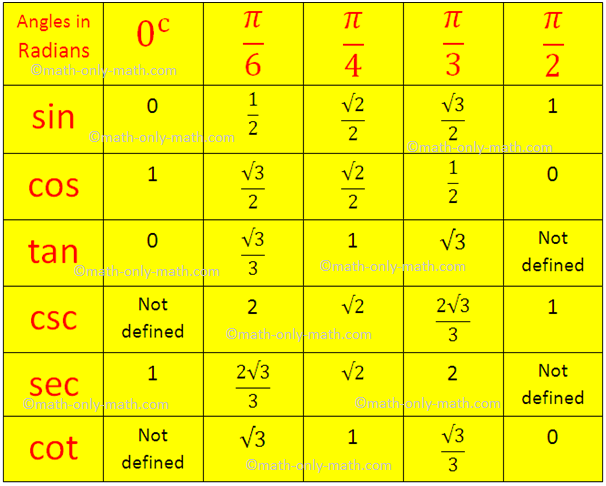 Since, we know the sin and cos value of the standard angles from the trigonometrical ratios table; therefore we can easily find the values of the other trigonometrical ratios of the standard angles. tan 90° = not defined. csc 0° = not defined. sec 90° = not defined. cot 0° = not defined.